Oh my gosh. This pie. Is soooo good. We discovered this pie when we lived in Michigan, just outside of Ann Arbor. There was a place nearby called the Grand Traverse Pie Company. Be still my heart. They made a slew of pies daily. Fresh and incredibly good. Sadly, I can’t find another place that makes those kinds of pies here back home in the Philadelphia suburbs. Sure, we have the Amish farmer’s markets nearby. And they do make a decent pie. But they don’t make this pie. 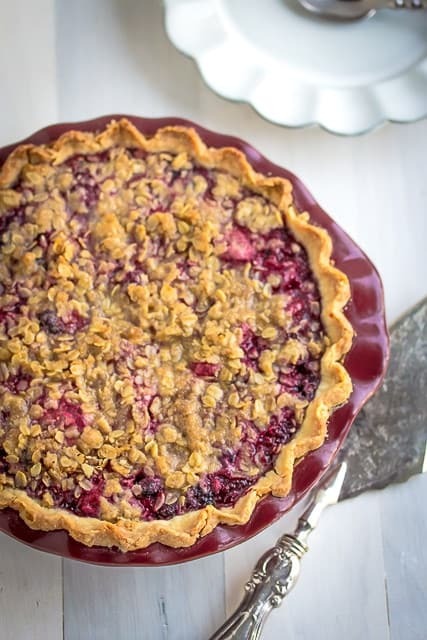 I’ve been able to find berry pies that either don’t have all the necessary berry varieties and there are those with a lattice topping in lieu of the crumb topping. I’ve also found pies that just lack flavor because of all the preservatives used to maintain freshness. Yuck. Really – there is nothing like homemade pie!! I think this is where Grand Traverse did their job well since they claim to make their own dough and they make pies fresh, daily. I suspect that this will be one of those recipes that my daughter will look for when she grows up and has her own family because she LOVES this pie. The pie is tart, but not too tart, and sweet too. The pie crust that I chose to make was based on a recipe from King Arthur Baking. Within the past month, I’ve made about 4 different versions of pie shells including Pioneer Woman’s recipe (called Sylvia’s pie crust) and finally settled on this one. Some pie crust recipes call for 100% shortening and claim to be the flakiest ever and there are those who swear by the use of butter instead of shortening because the flavor can’t be beat. I chose the middle ground and used half shortening and half butter so I feel that I got the benefits of both worlds. I also add a tablespoon of vinegar to add additional flakiness. But really, finding a good recipe for pie crust is only half the battle because rolling out that sucker is another battle, isn’t it? This is something that requires a great deal of patience and a good amount of flour because when that dough starts sticking, things can go downhill very fast unless you are patient. I used a fondant measuring mat underneath and it really saved me. 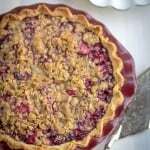 I found some great advice on Smitten Kitchen’s site about rolling out pie dough which really boils down to using liberal amount of flour and having lots of patience. Her mantra is “Flour well, roll, turn, repeat”. Other very useful advice on pie crusts can be found on DianasDesserts. Add cold butter and shortening and cut in with pastry cutter or 2 knives until the butter and shortening are pea-sized and evenly distributed. Add the vinegar and then drizzle the water, trying to distribute it evenly over the surface. Using the pastry cutter or your hands, works the liquid into the dough until it comes together. Use more water if necessary but try to use only what is needed. Remove one disk from freezer, flour each side well, and roll out from the center, to a diameter that is 1 inch larger than your pie dish (usually 11 to 13 inches). Use liberal amounts of flour, roll from center, turn, repeat and don't be tempted to throw the dough at the wall if it sticks. I used a fondant matte with circle guides that was tremendously helpful in rolling out my dough; this also helped prevent the dough from sticking and was useful to invert and peel the dough onto the pie dish. You can also transfer the dough to the pie plate by either folding the dough around the rolling pin, or carefully folding it in quarters. Remove the pie from the fridge or freezer and blind bake the shell using pie weights or dry beans/rice arranged on top of wax paper or parchment paper. The fruit must be well drained. If in doubt, let it sit out longer and drain more. Once the fruit has been thoroughly defrosted and drained, combine all ingredients in a large sauce pan and heat gently over low to medium heat until thickened, about 3 to 4 minutes. Stir often to prevent burning. The mixture will thicken a bit further as it cooks more and more importantly when it cools after baking. Combine all ingredients in a small bowl and mix well with fingers. Do not use food processor or the oatmeal will become too fine and the texture will change. Bake pie for about 40 minutes or until crust is golden brown and topping is cooked. I made your Mountain berry pie and I have to say, it was de-lish! I hope you don’t mind but I’m highlighting it, along with your blog, on my blog today, as I “celebrate the small things”. I made it with fresh berries and swapped out half of the white sugar in the filling with Stevia. It was perfect. Love the crumble topping also. The pie was a dead-ringer for the well-known company’s pie. I’ll make it again, for sure, when berries are in season. thank you! My daughter LOVES to make lemon bars so this is perfect!! Hello! So excited to try this recipe. GT Pie Co has apples in their Lakeshore Berry pie- how much do you think should go in? 3 pounds of blueberries? How many ups frozen blueberries would that be? I made this for Christmas and it was so good! I go to Interlochen in the summers and missed this pie so much this year since I couldn’t go. It was a little runny but that’s because I didn’t drain it as long as I should have (impatient). Still very delicious. I may have made the crust too thin because I had extra but just made a braid on the rim so it would look pretty! 🙂 Thanks for this recipe I’ll definitely be making it again. Thanks for the kind words, Genevieve – I’m glad you liked it. I love that pie also! The dough recipe makes two crusts. Does that mean the filling will fill two pies? This recipe is amazing! Takes me back to living in Traverse City & the comforts of Northern Michigan! I will for sure be making this again when my parents come to visit our family in Texas! Thank you! Thank you Christi! I miss being able to travel to Northern Michigan – sooo beautiful. I hope to get there again someday soon..
What would you recommend if I would like to use fresh berries (i.e. how much, and would it be the same process)? Thanks! Marian, I would go with 6 to 8 cups of berries (mixed; 30 to 40 oz) (depending on if you are using a deep dish pan or not) and follow the rest of the recipe. Let me know how that works out. I tried this recipe for my husband and my in-laws, and it was a smash hit! Thanks for the detailed instructions…I’m not too domestically inclined, so they really helped. It was a delicious pie, and I will definitely make it again. So glad to hear that, Christine! Thanks so much for sharing this recipe! I am bringing a pie to a friends house tomorrow and I’m going to try this one. I’m known among family and friends for making berry pies and always looking for new recipes to try. This will be great with some vanilla bean ice cream:) Yum! Thanks so much for this recipe. GTP Company is also my favorite destination when in Michigan. I would bring my husband home a pie on each trip up there. Now I have to make them myself. I can’t wait to enjoy the homemade version! !